Thank you for visiting the ARPC Action Shooters website. 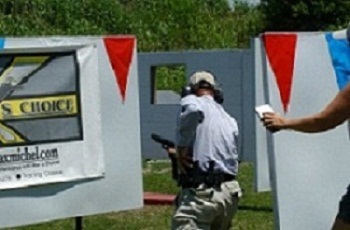 The club is dedicated to the advancement of a marksmanship discipline known as "practical shooting". This site contains wealth of information about practical shooting, club activities and other information of interest to the IPSC shooting enthusiast. ARPC Action Shooters is hosted by Arnold Rifle and Pistol Club in St. Louis, MO. It is a "member" club with some guest privileges. Anyone can come and shoot three times as a guest. This is 3 times total (two steel match, one IPSC match) or any combination of steel and IPSC match. After your initial 3 guest visits you can continue to come as a non-member with the following guidelines. Non-members who wish to participate in sanctioned matches and who meet all of the following criteria shall not be subject to the “three visit rule” above. You may also formally join by applying for membership to the Arnold Rifle and Pistol Club. ARPC Action Shooters shoot USPSA/IPSC the 4th Sunday every month. Matches are usually about 90 to 120 rounds. New shooters are always welcome, just let us know when you sign up and we will assign one of our experienced shooters to guide you through the match. Match fee is usually $ 5.00. Signup by 8:30am or check with match director. We are trying same day Set-Up on Sunday around 7:00am. Help during setup counts as work time if you are a member of ARPC. Check this web page before coming to the match in case of changes. We have Steel matches on the 1st and 3rd Saturday of the month. Round count is approximately 250 rounds. If you are shooting an automatic, bring at least 5 magazines. If you don't have 5 magazines contact the Match Director who might be able to help secure the magazines you need from shooters who might have spares. Steel matches are usually 7 to 8 stages, they consist for the most part of metal targets (never more than 5 in one stage) at distances of 7 to 35 yards. Most of the targets are either 12" round or 18 x 24" rectangles. They never require more than 5 rounds and are revolver neutral. Each stage is shot 5 times and the slowest time is thrown out. The best 4 are kept, the total time for all the stages is the match score. Its a lot of fun and good practice for IPSC/USPSA matches. Copyright © 2009-2010 by Midland Web Expressions. All rights reserved.